Rendering of proposed design for Peck Slip Park, presented to the Landmarks Preservation Commission on Jan. 22. Rendering: Quennell Rothschild & Partners and NYC Parks Dept. For Peck Slip Park, it’s not easy becoming green. That was clearer than ever last Tuesday when the Landmarks Preservation Commission wrestled for the second time in two months with the proposed design for the two-block-long park, a dozen years in the making. While approving the overall scheme, the commissioners said they were still unsettled over the most basic feature of a park. Trees. 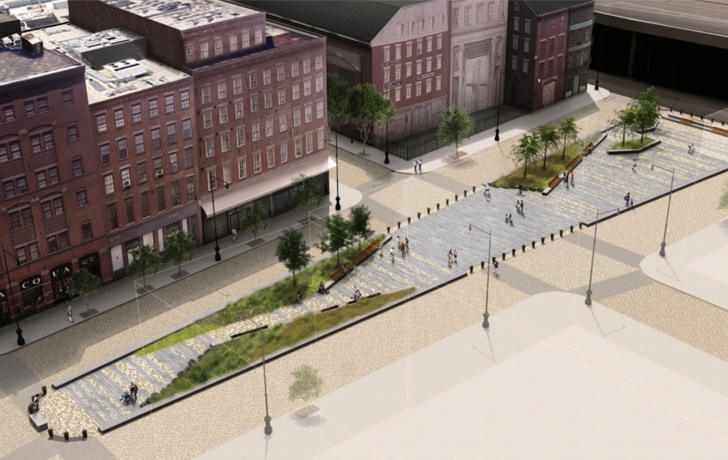 In December, landscape architect Alison Shipley of Quennell Rothschild & Partners along with the city Parks Department had presented the commission with a plan featuring materials and design details that they said reflected the historic Seaport. The design also called for 13 trees in three varieties. But the commissioners were largely split over the suitability of trees in this historically leafless space between Water and South Streets. Some also worried about the impact of trees on views of the Brooklyn Bridge and the 1807 Jasper Ward House on the corner of Peck Slip and South Street. In response, Shipley returned this month with a modified plan of just nine “light foliage” honey locusts and “a simple pallet” of low-lying planted material. Only 14 percent of the 2,600-square-foot space would be planted, she emphasized. Indeed, the area was part of the shoreline of the East River before it was turned into a mooring slip. Once paved, the wide street was a site for the neighborhood’s busy maritime commerce and nearly two centuries of fish mongering. How to be true to that rich city history while creating a park that fits the Seaport’s burgeoning residential neighborhood has been a growing question since 2006, when $4.3 million in federal post-9/11 funds was allotted for the project. At Community Board 1, a debate had ensued over whether a wide-open “piazza” style space should be created, or one more green and park-like. The original plan that won out, approved by the Landmarks Commission and Community Board 1, included grass, flowering plants, shrubs and trees. Its design attempted to evoke the site’s history with sculptural steel-and-wood elements meant to suggest the ribs of a ship. In the pavement between Front and South Streets was the stone outline of a ship, with steps that dipped into a slight depression in the pavement as if into the boat’s belly. But construction was long delayed because of underground street work, followed by damage from Superstorm Sandy. In the meantime, the city’s Parks Department heard complaints about the plan from those who wanted to scrap the sculpture and keep the space simple and open, not so different from the makeshift plaza that is there now. That point of view was amplified at a CB1-sponsored town hall in September 2017. “Less is more,” said a mother of two, echoing other parents who wanted room for children to ride bikes and kick balls. “Just keep it a beautiful open space.” Shade trees were also included in the requests. The revised plan shown to the Landmarks Commission in December, with plantings and trees, new paving and bench seating—but nothing sculptural—had won wide community support. But now after two sessions before Landmarks, it’s back to the drawing board for an acceptable tree plan, to be worked out between the architect and the LPC staff. Commissioner Adi Shamir-Baron, who had been among those who questioned the green spaces in this “so special” slip, noted that simply removing trees did nothing to make the overall plan more acceptable. “To achieve what?” she asked.